Born Into Brothels, Jon’s work at Revere, Random Family. Zana Briski's Born Into Brothels has similarities to my brother Jon's work and that of Adrian Nicole LeBlanc. There are many incredibly painful moments in Zana Briski’s brave, wrenching and haunting film, Born to Brothels. We learn at the film’s end that Suchitra’s aunt did not allow her to leave the brothel. Watching the film’s special features reveals that three years later her aunt had not made her join the line, and my feeling was that that was a temporary condition. 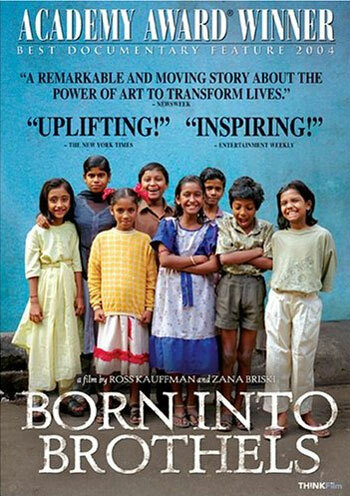 The sense of bright, beautiful and resilient children being almost inexorably swallowed up by social forces far greater than them and not of their creation pulses through Briski’s film, even as she offers photography and tenacious intervention as tiny antidotes that knock a few of the children away from their socially prescribed destiny. The film, which garnered dozens of awards, including the 2005 Academy Award for Documentary Feature, is based on the premise that art and love can be tools for individual, if not collective, transformation.